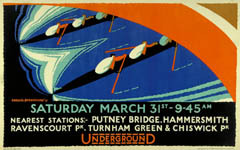 The annual Oxford versus Cambridge University Boat Race traditionally marked the start of the London sporting season and was often promoted with a special Underground poster. 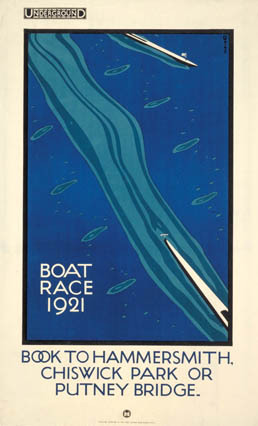 In his wonderful poster, Charles Paine shows only the tips of the boats and the splashes left by the oars to convey the excitement of the competition. In 1921 Cambridge were the winners by just one length. Paine’s artistic training began with an apprenticeship in stained glass. Both poster design and stained glass rely on striking colours and strong, simple images. By limiting his palette to just four colours, Paine creates an instantly striking and recognisable image which could have been economically reproduced. London is a great place to catch some sporting action, and we’ve got plenty of sport posters in our exhibition, Poster Art 150, including another boat race poster from 1928 by Percy Drake Brookshaw. Later in the year we’ll be sharing some of our favourite rugby, football and tennis posters with you in this blog too! This Sunday the 159th Boat Race will set off from Putney, with Oxford and Cambridge University rowing teams battling it out to the finish in Mortlake. The Cambridge team are currently in the lead, with 81 wins, whilst Oxford has 76. Why not head down to the river this Sunday and cheer on your favourite team!